Good live country music in Columbus can be hard to find. The Bluestone has been proud to host stars like Kix Brooks, Thompson Square, Aaron Lewis, Matt Mason, David Nail,Brett Eldridge and many more. With acts like these, you can count on finding the country music shows you know and love right here in Downtown Columbus. Get down with live country music in Columbus. Live shows at the Bluestone will give you plenty of reason to hit the dance floor, sing along and have an all-around good time. We book the country bands you love because, well, we love them, too. We have our fingers on the pulse of the emerging artist pool, so when you come to a live show at the Bluestone, you’re guaranteed to walk away knowing you just heard some of the best in live country music. We speak from experience when we say there’s nothing quite like the Bluestone. The acoustics of our lofted ceilings, combined with the authenticity of a converted church, form the perfect space for a great band and an excited crowd. From our three separate levels to all seven of our bars, the Bluestone is the whole package. The Bluestone welcomes back Country Music Duo Love and Theft. Love and Theft played to a sold out crowd last time they played The Bluestone and plan on delivering another great show on Feb 15th 2019. Tickets are on sale now at www.liveatthebluestone.com. Just in time for Halloween, here’s a cultishly creative masquerade video for “Need to Breathe,” a fast moving. spot-on single from Curb Records’ platinum-selling duo Love And Theft. This official video artfully shares the sense of urgency offered in this fun, rockin’ banjo-laden, love-soaked anthem. 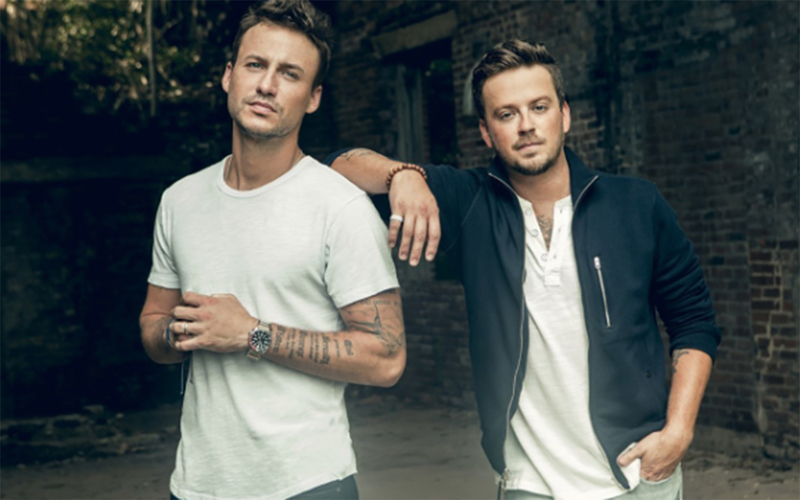 With “Need To Breathe,” Stephen Barker Liles and Eric Gunderson, the duo behind Love and Theft, mark the next step in this country chart-topping band’s musical journey, leading to an anticipated new album release in January 2019. Morgan Wallen Turns The Bluestone “Up Down” With Ray Fulcher and Matt Chase! Last night’s show kicked off with country newcomer, Matt Chase playing an acoustic show. His camouflage pants and black graphic t-shirt matched the laid-back feel he brought to The Bluestone. His debut single, “Catch Girl” delivered an attention-grabbing melody, strong lyrics and showed off his smooth vocals. Fulcher’s opening song, “Song of the Summer” brought an upbeat, groovy beach feel to the crowd. During the set he made a priority to get around the stage with an energetic demeanor, keeping the crowd excited and engaged. For Fulcher, playing The Bluestone was an exciting moment; “The history is incredible, and the energy is very different from any venue out there,” he said. After a short break, the headliner Morgan Wallen took the stage. He is one of country music’s newcomers, but his fun-loving personality makes his show one you do not want to miss. His opening song, “Boots on the Ground” is a party song that has not yet been released. Wallen’s stage presence was infectious as he danced with the crowd and skittered across the stage with a big smile, performing his songs perfectly. Wallen admitted that he likes to play an Eric Church song during every show and then led into Church’s “Drink A Little Drink.” The crowd became rowdy and joined in, singing along while raising their beer bottles high. The show ended with Wallen’s current hit single, “Up Down.” The song has a swampy guitar sound that goes with the lyrics about fishing and drinking. This last one was clearly a crowd favorite as the singing along echoed back to Wallen throughout the entirety of the song.